When you’re looking for a vehicle at an incredibly low cost, there’s one category that you should investigate: salvage title cars. Many buyers, and indeed many people looking to build a business, have discovered the benefits of buying a salvage car. Ignored by many buyers, these vehicles present an great opportunity for the savvy buyer with a bit of mechanical skill. To fully appreciate the benefits of salvage cars, you must understand what they. In a nutshell, these are vehicles that have had their insurance policies paid out to the insured at 75% or greater of the vehicle’s value. (The rate varies by state.) Once the insurer pays out, state authorities issue a salvage title for the vehicle. This is, however, not the only reason a vehicle may have a salvage title. For example, consider the case of a stolen vehicle. After the car has been missing for some time, the insurer pays out the policy to the insured. If that vehicle is later recovered, the insurer takes possession. Then they give it a salvage title. In this instance, the vehicle itself may not have sustained any damage at all. Even in the case where a vehicle is damaged, though, things are not always cut and dry. For example, there may be certain cases in which an insurer pays out a policy as a matter of speed rather than as a matter of cost. Even if this isn’t the case, the ‘cost of repairs’ as determined by an insurer may be much higher than what’s needed. You can now see how salvage car or truck aren’t what they might appear at first sight. Provided one can source a salvage car that’s in reasonable condition, the potential for savings is huge! Where Can You Buy a Salvage Car? To buy a salvage car, you will want to look into online car auctions. Through these auctions, everyone – regardless of whether you have a dealers license or not – can access dealer auctions taking place across the country. Because of this, you can browse an large inventory. This gives you a much better chance of finding that diamond in the rough that can turn you a profit. Furthermore, online dealer auctions give you the chance to research the vehicles. With any salvage car you find, you’ll have access to the car’s VIN. With this, you can take advantage of a third-party source to request a vehicle history report. Using that, you can gain insight into how a vehicle became ‘salvage,’ and whether or not it will make a good investment. 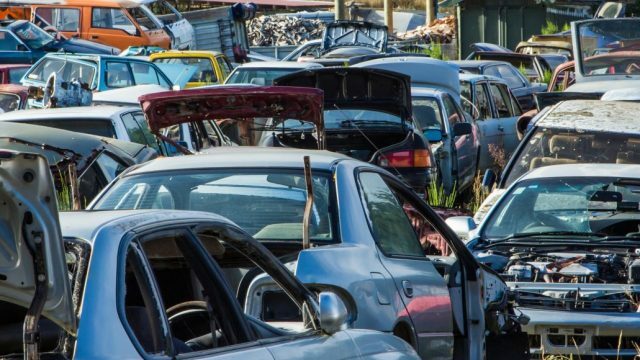 Before getting involved with salvage cars, it’s important to note that there are a few potential drawbacks. The most notable of these have to do with insurance and DMV inspection. To be sure, securing liability coverage for a salvage car should be relatively easy. Typically, you won’t have any problems getting this kind of coverage from an insurer. However, things are a little different when it comes to comprehensive coverage. For obvious reasons, many insurers are afraid to provide comprehensive coverage to vehicles rebuilt from salvage. However, this does not mean there are no options. You only need to work with an insurer that specializes in salvage cars to secure comprehensive coverage. Do note, though, that premiums for these policies are typically quite expensive. You also need to understand the nature of a salvage title. Once a vehicle gets the designation of salvage, it will always carry that designation. And this is so even if you rebuild it to near mint condition. This status will have some effect on the resale value of the vehicle. In the end, though, the benefits far outweigh the drawbacks we mentioned above. Due to the incredibly low prices you can buy and rebuild these cars for, the trouble with insurance and resale value isn’t significant. There are two primary ways in which one can make money on salvage vehicles. First, you can use salvage cars to mine for spare parts. Second, one can essentially ‘flip’ salvage cars to turn a profit. As you likely already know, auto parts can be quite expensive, particularly for rare and luxury vehicles. When you purchase a salvage car to obtain spare parts, you’ll likely find that the cost of the car is far less than the cost of the spare parts. When rebuilding cars from salvage, the you will get the most money with collectible and luxury automobiles. If you are going to follow this route, be sure to remember what was mentioned about a salvage car always carrying its designation. It would be unlawful to resell the vehicle without disclosing that it has been rebuilt from salvage. The above are just the two primary ways in which you can make money buying a salvage car. There are others. To find out what your options are, and to get your entrepreneurial juices flowing, you should take a look at what’s out there. Simply create an account and start browsing the volume of salvage cars available through Auto Auction Mall. You’re sure to find vehicles that will meet your particular needs and budget.